The onslaught of app updates for iOS 12 continues today with Bear reaching version 1.6. 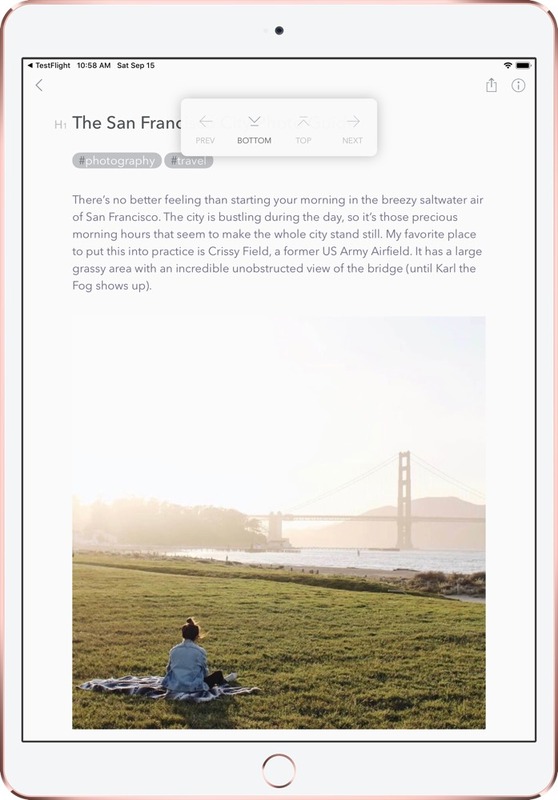 Our pick for the best note-taking app for iPhone and iPad is ready for all iOS 12 devices and for the latest macOS Mojave update. Bear 1.6 is a major point update for Bear as a whole, but there are unique features coming to both iOS and macOS that are worthy of their own mention. Bear 1.6 introduces Siri to your note-taking arsenal. Using Siri, you can create notes on iOS by simply dictating your thoughts. This is particularly useful, say, when you’re commuting to work and aren’t able to put your hands on a keyboard. 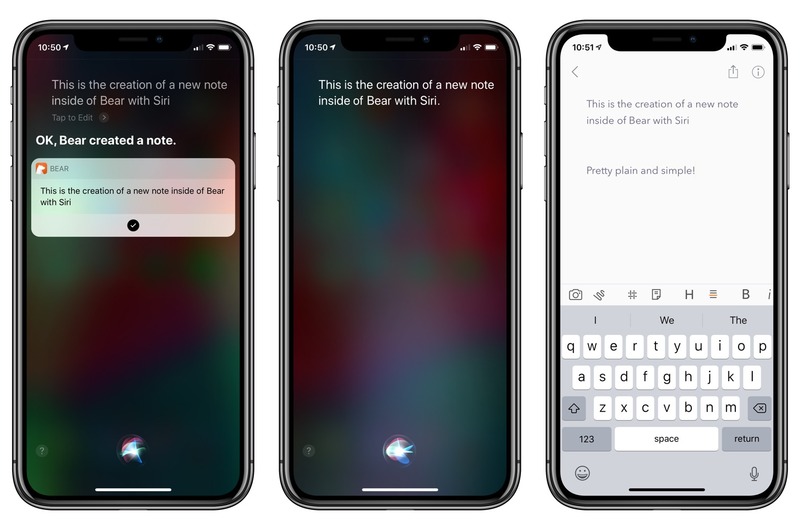 Have Siri create a new note inside Bear with your dictated thoughts and return to it on your Mac or iPad later on to tag the note and complete the thought. Siri can also be used to search for notes within Bear. This can be done whether Bear is open or not, giving you the ability to search for a past note or research bit with your voice while you continue working on other aspects with your hands. Tap into the navigation menu to move to the beginning or end of a note or to your previous or next notes in your note list. Use two finger swipes to skip over this navigation menu entirely. This will take a little bit of muscle memory practice, but once you learn Bear’s new navigation swipes, it’s sure to speed up your navigation within the app. New header linking features will be great for those folks with long notes or who are using Bear to write their next novel. 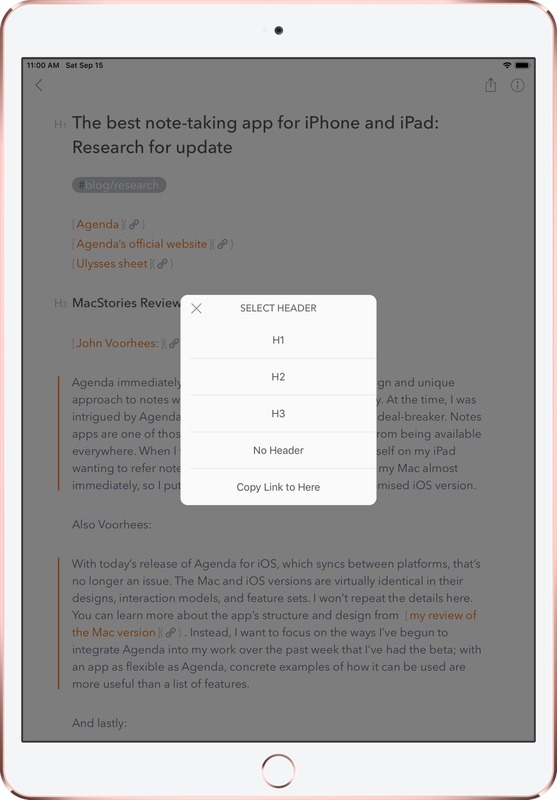 Using any of the H1-H6 header levels, you can tap or click on any header in Bear 1.6 to generate a link directly to that header. Then, if you paste that link into a different note, you can tap or click on that link to jump right to the linked header. The usefulness of header linking is sure to be dependent on your breadth of use in Bear. 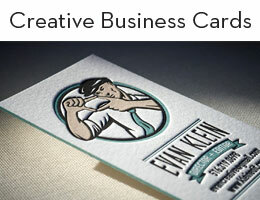 If you use Bear as a scrapbook for capturing ideas, header linking may be less useful. 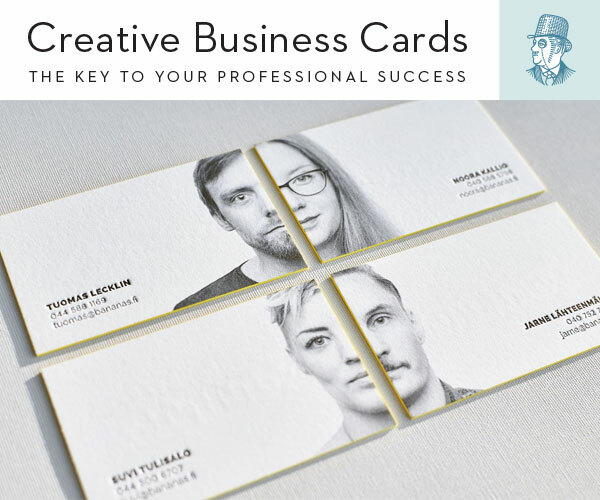 However, if you like to write inside Bear or if you like to build out long notes with lengthy research, header linking is sure to add that much appreciated extra organization across multiple notes. Bear Pro subscribers will see an improvement in Bear 1.6’s sync transparency. Bear 1.6 will show you when it last synced and whether or not there were sync issues. 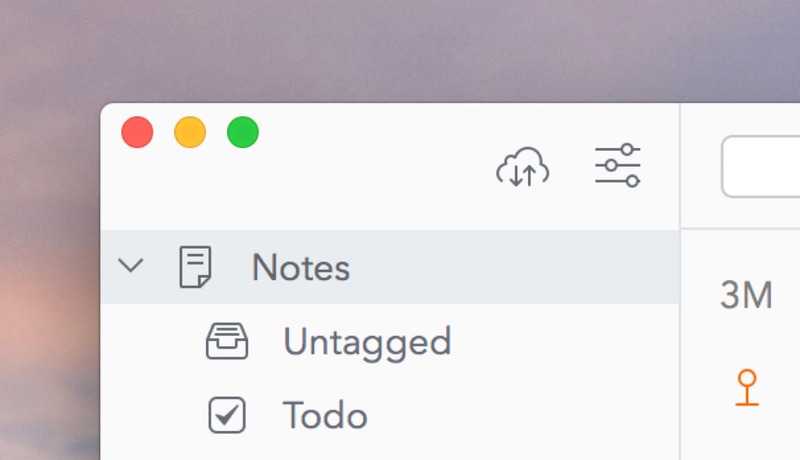 And, if you run into sync conflicts — say, a note on your Mac needs to overwrite a note on your iPad — Bear will now display those conflicted notes in the sidebar. Bear will save your scroll and cursor position when you switch or leave a note. Dark mode support is coming to Bear for macOS. There are a range of dark themes already available within Bear, but this new dark mode is natively supported. One new theme has been added for all users. Dark Graphite looks right at home on macOS and iOS. One new theme specifically for Bear Pro subscribers: DuoTone Heat. A range of new TagCons are now available. New iMessage stickers have been added to Bear’s iMessage app. What started in 2014 as a project for quickly creating and organizing notes, Bear has become one of our favorite apps on the App Store. It’s our pick as the best note-taking app for iPhone and iPad thanks to its rock solid sync, great capture features, and ability to capture all sorts of media. Others have noticed too, as Bear won a 2017 Apple Design Award and the app is seeing immense user growth all across the world. The growing user base and evolving feature set have allowed Bear’s development team to continue bringing new features to the app. We’re very excited for the companion web app due sometime in the future for capturing notes regardless of what device you find yourself using, as well as the option to lock notes and create Markdown tables inside notes. You can pick up Bear for free for iPhone, iPad, and Mac, or you can check out our review for more information.